WASHINGTON, D.C. -- The nation’s largest Hispanic college internship program this year topped the 4,000-mark in student participation in the Hispanic Association of Colleges and Universities (HACU) National Internship Program. 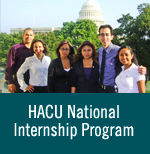 The HACU National Internship Program (HNIP) was created in 1992 to directly address the Hispanic employment gap in top-paying positions in the public and private sectors. Each year, the program provides paid internships to hundreds of Hispanic college students at leading corporations and federal agencies, providing interns valuable on-the-job experience and professional development opportunities. “HNIP is proving extraordinarily effective at opening new doors to career and leadership opportunities for the nation’s youngest and largest ethnic population. Indeed, many former interns today are full-time professionals as a direct result of their participation in this remarkable program,” said HACU President and CEO Antonio R. Flores. HACU, the only nationally recognized voice for Hispanic higher education, represents more than 340 colleges and universities serving the largest concentrations of Hispanic higher education students in the United States. HNIP provides paid 10-week and 15-week internships to selected students during spring, summer and fall sessions at dozens of participating federal agencies and private corporations at offices located in Washington, D.C., and throughout the country. The deadline is February 28 to apply for the program’s summer 2003 session. A recent, independently researched report on the program labeled HNIP an “enviable” federal recruitment tool based on a consistently high rate of permanent job offers that are made following the internships. Internships match a student’s field of study and career goals to the needs of participating federal agencies and corporations. The start of the spring session in January pushed total student participation in the program since 1992 past the 4,000-mark, following two straight years of record annual participation of more than 600 interns in 2001 and again in 2002. A new web site at www.hnip.net this year is offering an online application system, as well as continually updated reports from current and former interns who offer advice, encouragement and detailed descriptions of their internship experiences. “These reports from our interns -- their praise and their new excitement about the future -- are the best testimony to the overwhelming success of this program,” Gil said.